If you're trying to live a chemical-free lifestyle and decrease your carbon footprint in the world, you probably concentrate on eating organic foods or eliminating toxic cleaners from your home. But there's something else to consider -- your cookware. Some cookware lines are covered in coatings that release dangerous chemicals when used over high heat or when scratched. Luckily, you can scramble your eggs and stir-fry your shrimp with confidence by choosing eco-friendly cookware. Chantal Copper Fusion Cookware: This gorgeous, seven-piece cookware set features enamel non-stick and is lead and nickel free. Each pan in the set is also refrigerator, freezer, and dishwasher safe. The set includes a 1.7 quart saucepan with lid; three quart saucepan with lid; six quart saucepan with lid and ten-inch fry pan. Price is around $560 with free shipping. 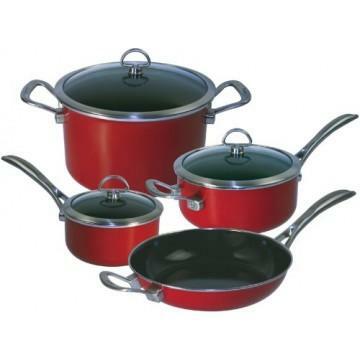 Cookware Reviews gave the set a positive rating for its non-stick surface, no metal transfer, and easy clean-up. Cuisinart Green Gourmet Cookware Set: Cuisinart uses ceramic, non-stick technology in their green cookware line. The cookware features hard anodized construction and riveted recycled stainless steel handles. 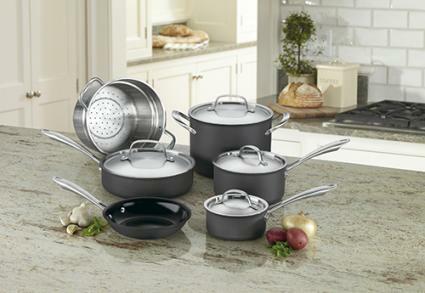 This ten-piece set includes a one quart saucepan with lid, a two-and-a-half quart saucepan with lid, a three quart sauté pan with lid, a six quart saucepot with lid, an eight-inch skillet and a pasta insert. The set costs under $200 with free shipping. Crate and Barrel customer reviewers gave this lightweight cookware consistently good reviews for its easy clean-up, effective non-stick surface, and durability. 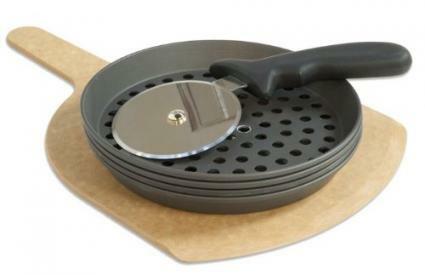 Thermolon Frying Pan: No kitchen arsenal is complete without a good frying pan. Thermolon is a ceramic coating that contains no PFOAs or other toxic chemicals. Eco-Friendly Cookware offers a sleek, Thermolon-coated fry pan in several sizes. Prices start around $40 plus shipping for an eight-inch pan. The pan received reliable ratings from customers for its non-stick surface, easy clean-up, and functionality. Stone Earth Pan: This unique ten-inch pan uses a non-stick coating made from stone. It's made of die-cast aluminum and features a riveted, silicone handle. The pan costs about $35 plus shipping. Amazon customers overwhelmingly gave the pan excellent ratings. One happy customer says it's "the perfect eco-friendly frying pan". 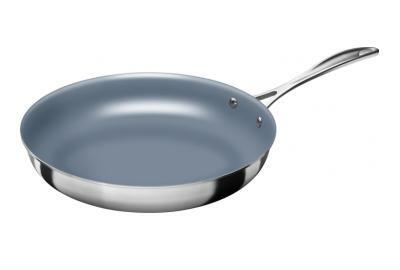 Ecolution Griddle Pan: Ecolution uses an exclusive water-based, PFOA-free, non-stick coating in their pans. This griddle pan is made of aluminum, has a silicon handle and is dishwasher safe. The pan is priced at approximately $22 plus shipping. Reviewing customers at Amazon say they love the pan and that it works "flawlessly". LloydPans Stir-Fry Wok and Steamer: Formerly known as ManPans, Lloyd offers a full line of eco-friendly cookware that is Teflon-free and made in the U.S.A. Their stir-fry wok with steamer features a ten-inch stir-fry pan, steamer insert, and glass lid for about $115 plus shipping. Caution: Caveman Cooking did a full review on the wok and steamer and loved the piece for its lightweight, great non-stick, ease of use, and easy clean-up. LloydPans Pizza Party Set: Eco-friendly pizza pans can be hard to find but ManPans has stepped up to the plate to offer this complete pizza pan set. It includes four eight-inch, perforated pizza pans (oven-safe up to 700 degrees), a wood pizza peel for easy oven transfers and cutting, and a pizza cutter. The cost for the set is approximately $70 plus shipping. A Two Classy Chicks review highly recommends the pizza set and noted the cutter "works like a dream" and the pan doesn't need sprays or oils. In the 1980s, non-stick Teflon cookware was all the rage. However, it wasn't long before environmentalists and health advocates alike were screaming foul. According to Good Housekeeping.com, Teflon releases chemical compounds and fumes that may be toxic to you and the environment. While these fumes won't kill you, they can give you flu-like symptoms and can easily kill your pet birds. Since it's not difficult to overheat a pan, this is a serious concern. Teflon is believed to contain Perfluorooctanoic Acid (PFOA). While the final verdict is still out and research is conflicting on whether or not PFOA is dangerous, the American Cancer Society suggests that PFOA may increase the risk for certain types of cancers, and low levels of PFOA is common in human blood and in the environment. Using eco-friendly cookware can't guarantee good health, but because these pans are non-stick, you can greatly reduce the amount of unhealthy oils or fats you use when you cook. In addition, the cookware is better for the environment and a cleaner environment benefits everyone.